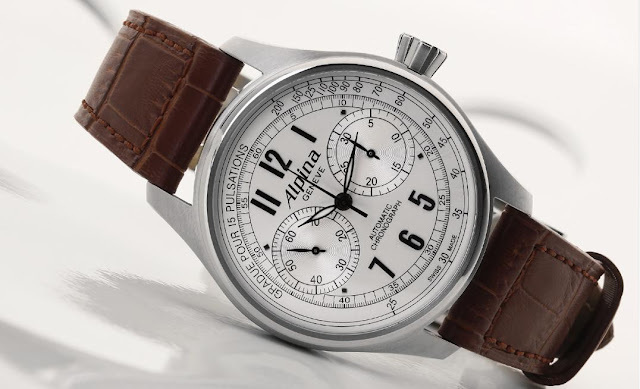 Alpina has pored through its 1920s and 30s catalogues to seek the the inspiration behind the handsome new Startimer Classic Collection. Alpina were the official supplier of pilot's watches to various air forces during these two decades. The design is deliberately less sporting than on the original models and are housed inside a stainless steel case. The silvered and elegantly decorated dial now displays chronograph counters at 3 and 9 o'clock, in harmony with the six oversized Arabic numerals. Founded over a century ago by talented watchmaker and marketeer Gottlieb Hauser, Alpina carries on its tradition of innovation and robust, good quality design. The Startimer Classic Collection is available with two different calibres; a three-hand automatic version with date (cal AL-525) in a stainless steel case and available with either blackened steel indexes or rose-gold plated indexes. The second version is the Chrono-Automatic (cal AL-860, pictured) with two chrono-counters, in a stainless steel case and available with either blackened steel indexes or rose-gold plated indexes. In addition, the Chrono-Automatic comes in a special vintage variation with a telemeter indicator on the dial.